Poor poor saxophone, what have they done to you?! 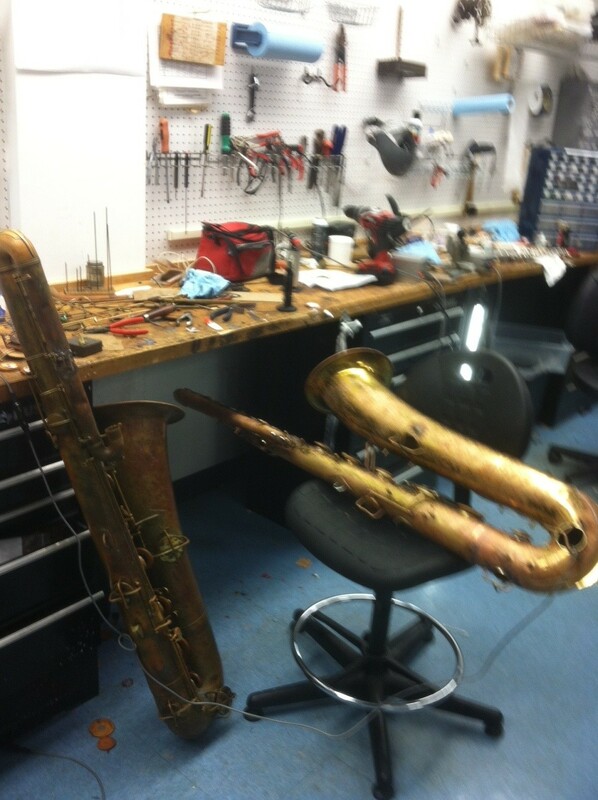 So here’s a Yamaha 52 Bari sax that came in from a school who had previously had work done by Music and Arts. Apparently they needed to replace a post. It looks like they just took a post off a silver horn and soldered it onto the sax without bothering to fit it whatsoever to the key or rod. This is why you don’t get repairs done by people who don’t know or don’t care about what they’re doing. 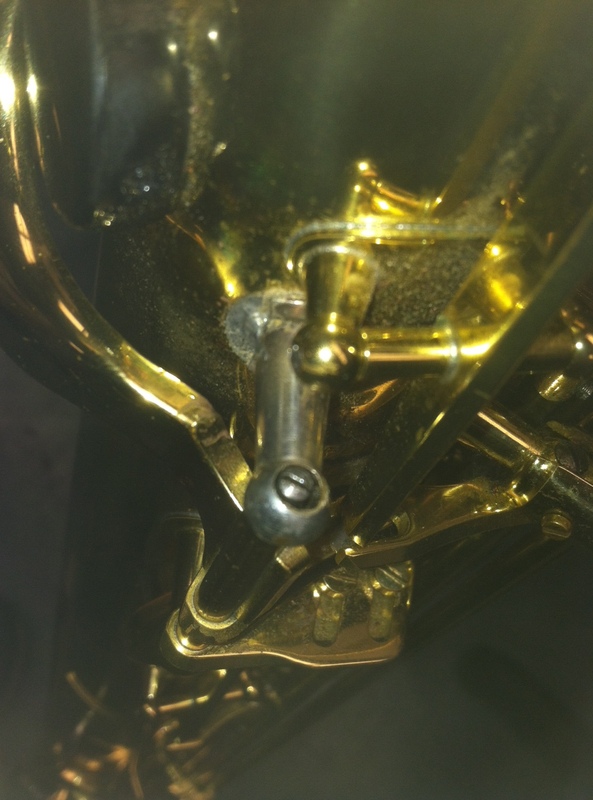 A word of advice: If you need work done on your horn and you care about quality repairs, please stay away from stores that do school rentals. Now this isn’t always absolutely the case; there are some stores that rent instruments that actually have good repair departments, but generally, you’re going to run into a bunch of hacks if you go to a store that derives the majority of it’s profit from rentals. There’s nothing wrong with rental shops if you want to rent an instrument, but if you want quality repairs, go to a dedicated repair shop. Look at the picture and don’t say I didn’t warn you. 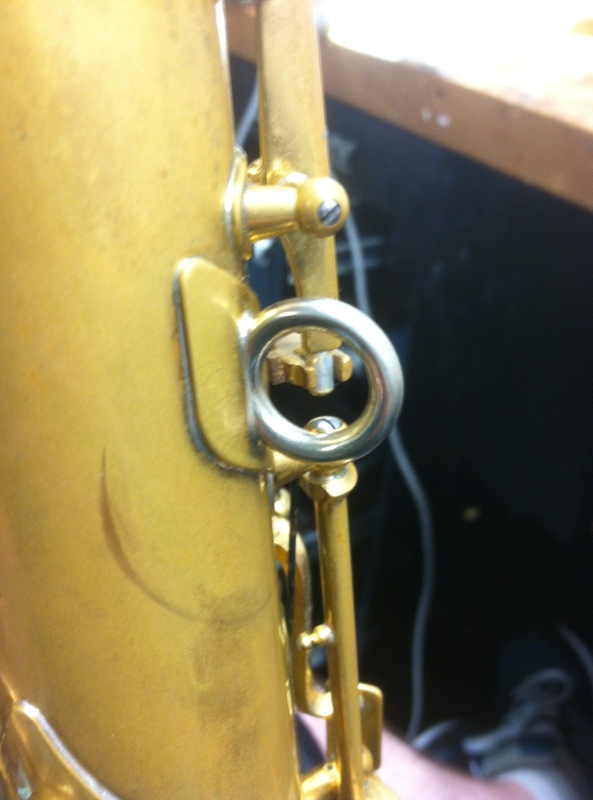 Here’s the neck strap ring on a Yamaha Custom Z alto sax that I was working on today. Notice that it’s made of stainless steel and not brass like on most other horns. If you have a quality neck strap with a stainless steel hook, after a lot of use, the stainless steel hook will eventually wear through the brass ring on the horn and you’ll have to have the ring replaced or risk dropping your horn. Yamaha was smart and added this nice little feature so you won’t have that problem. I wish more companies would put this much thought into their designs. 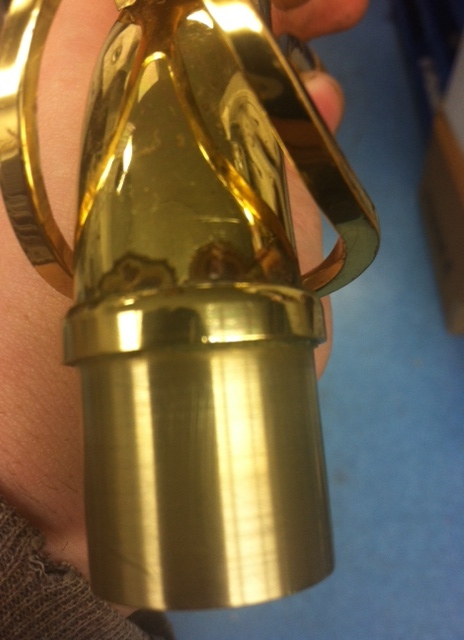 Pictured above is an all too common sight on modern horns: Brown discoloration beneath the lacquer that shows up after a while. I see this on low quality horns as well as the name brand pro level horns. My own Bach Stradivarius trumpet had this issue around the bell wire. This is what happens when you speed up production and don’t properly prep a horn before lacquering. Soldering flux is very acidic and if you don’t completely wash it off and neutralize it after soldering, you get discoloration of the metal and the finish. This can happen with repairs and it happens at the factory when the instrument is built. In this case, after the neck was soldered together with the neck tenon it wasn’t properly cleaned and they lacquered over the metal while there was still soldering acid on the joint. At first, the horn looked fine but after a while the acid reacted with the lacquer and produced this gross brown stuff. You can see how it’s spread out from the joint where the acid was concentrated at. This is easily preventable with proper cleaning and neutralization of the part before it is lacquered. Unfortunately, you can’t repair this issue without removing the original lacquer from the area and re-lacquering it, which in most cases isn’t worth doing. So you’re stuck with this ugly mess. There’s a disturbing trend in musical instrument manufacture: Companies are producing lower quality instruments with a higher price tag. I’ve worked on thousands of instruments. As I’ve repaired, cleaned, and tested, and sold these horns, I’ve gotten to see all sorts of levels of quality in their manufacture. I’ve worked on $89.99 purple clarinets made in Chinese sweat shops to $10k bass saxophones made in the 1920s. Anyone who’s done a decent amount of repair work can tell you there’s a wide spectrum of quality in instruments. It’s from getting my hands dirty tearing these horns apart and building back up again that I can give you my opinion regarding the general state of the musical instrument manufacturing business: It ain’t what it used to be…mostly. A hundred years ago, there were no student level or pro instruments. All the instruments were generally offered in one standard. There were different models available; a trumpet suited for jazz vs a trumpet for orchestra work; but all the instruments were suitable for a professional player. No one would know what you meant if you said you wanted a ‘student level trumpet’ back then. Different manufactures were known for certain instruments and models and they were all constantly trying to out-do one another with the latest advances in instrument design. It’s one of the reasons you’ll find such huge number of models of vintage instruments. It worked somewhat as the consumer electronics industry works today with iPhones and Samsung Galaxies, this tablet pc and that HDTV. And this sort of competition drove advances in instrument manufacture and design. At some point the instrument companies decided to split their production into student and pro level instruments. The idea was that the student instrument would be more affordable than a pro instrument, more durable as far as accidental damage, and easier to play for a beginner. Take for example, the original Bundy line of instruments from Selmer. These horns were tanks: You could drop them, never clean them, forget to oil the valves and keys and they’d keep playing. The construction was solid and well designed. You can find them today relatively inexpensively and have them overhauled or cleaned and they’ll play for another 50 years. Student instruments opened new markets for the manufacturers and and new opportunities for the masses to get involved in music. With the successes of the student level horns, companies now had an entirely new market and a new system in place to mass produce instruments. Eventually, someone came up with the idea of the ‘intermediate level’ instrument. From a business standpoint it was a clever move. Lots of other consumer products had entry, mid, and upper level products being sold, so why not musical instruments? The intermediate level horns being offered then and today (for the most part, yamaha saxohpones being an exception to the rule) aren’t really much different than the student horns apart from some cosmetic upgrades and a few changes in materials here and there. Some would disagree with me, but in my experience, you’re paying for silver plating and some mildly interesting engraving on intermediate horns and that’s about it. Intermediate horns, in my mind, are best left alone. They may look somewhat like a pro instrument, but when it comes to actually playing them, they’re really not any better than a student instrument and in some cases are actually worse. I see them like I see those Hummer H2 SUVs that were popular in the mid 2000s: They may look similar to an actual hummer, but try to drive them the same way and you’re going to get yourself into some serious trouble. But hey, they sold! And that’s why they’re there. So intermediate horns sold well. But the companies still wanted to make more money. But how? Shorten production time. Musical instrument are still made mostly by hand, automation simply hasn’t been completely developed nor integrated into instrument manufacture and for some work, like padding a woodwind instrument, it probably won’t be any time soon. So you could hire more workers or you could increase the load on each worker. It’s much cheaper to simply increase work load and since there’s still only 8 hours in a workday, now a trumpet bell maker in an instrument factory might have a quota of 20 bells a day vs the 15 he had ten years ago. All of that means less time spent on each part which inevitably leads to lower quality. Another example of the cost of the speed up can be seen if you look at clarinet manufacture: They’re made of African Blackwood and the wood should really sit for a few years and dry out before it’s machined to ensure the piece won’t crack. But while in the past the wood might sit for 3 years before it was made into a clarinet body, negating most instruments from developing cracks, today it might only sit for a year. The result is a whole bunch of unstable clarinets cracking.Finally, and this is something that really bugs me, there’s a growing problem with the finishing of brass instruments; specifically the buffing and degreasing process but I’m going to write about that in a later post. SO! What we have today is a multifaceted issue but the driving force that’s causing most of the problems is modern business management techniques: More work + less time x marketing spin = more profit. 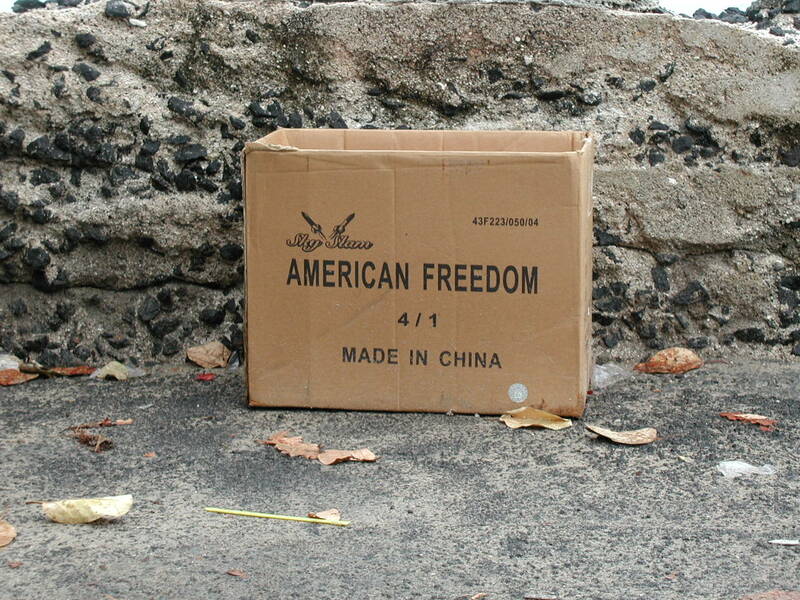 In some fields that might work fine, retail for example, but in manufacturing, it isn’t conducive to a quality product. If I was wrong, why do serious musicians often seek out vintage instruments and hold them up as examples of quality not seen in modern productions? Heck, look at Selmer; they have the Reference series of saxophones that are supposedly a sort of copy of their famed Mark VI line. They’re basically admitting they can’t make their own horns the way they used to! The Bach part of Selmer is doing the same thing with their Artisan series trumpets. There’s even some company that bought the old Bundy name and is slapping it on junky Chinese instruments and you know what their slogan is? Bundy: The return of a legend! I don’t know who thinks the Bundy name is legendary, but anyway, it proves my point, the instrument manufacturers are seriously lost.